Is Siza Charity Network legit? Is Siza Charity Network above board since they claim they can make you a millionaire if you pay R500 to join. Kindly advise. The so-called Siza Charity Network is a pyramid scheme, it’s a simple as that. They on their web site that they’re “a non governmental organisation registered and established in South Africa” which is true but they’ve only been registered since 4th January and their domain was registered just before the New Year. This is a company that is less than a month old. Their business model is very simple. There are no products, no services, nothing at all, it’s just about recruiting multiple levels of people and making profit from the money they pay to join. Siza have been imaginative and have given these levels names: Builder, Sapphire, Ruby, Emerald, Diamond, Crown diamond, Ambassador and Crown Ambassador. However, the curious thing is that these are exactly the names that was used by the Jamalife pyramid scheme last year. Either it’s the same people running a new scheme or they’ve just stolen the idea from other scammers. I had a WhatsApp conversation with one of the people recruiting people into the scheme and I asked a simple question: “Do I need to sell anything?”. I got an answer that explains everything you need to know: “U don’t sell anything you recruit 2 people to join under you an tell those people to do the same.” I asked if members make money just by recruiting other and she told me “Yes dear”. I urge you to avoid wasting your time, effort and money on this obvious scam. Even if you could believe anything they say, to reach the top and achieve the millionaire status they promise, I’ve done the maths and you would need to build a pyramid of almost 17,000,000 people. You think that’s likely? 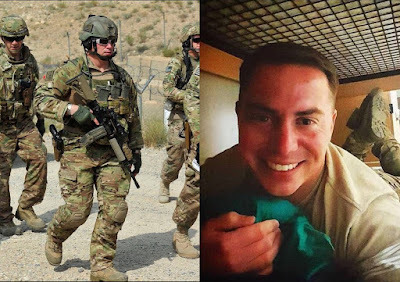 My boyfriend is deployed in Syria by the US military and has asked his 'lawyers' to process my application to come and join him in the US. My boyfriend says he doesn't have access to money in his account to pay and he was asking me to pay the money to the lawyer Kennedy Solicitors for processing fees. If you can kindly use your informed and trusted sources to verify if indeed such company exists in the US and they are a registered law firm. I'm a but skeptic with the lawyers way of writing as I have so much respect for the profession. Please let me know if you can help before I find myself scammed. 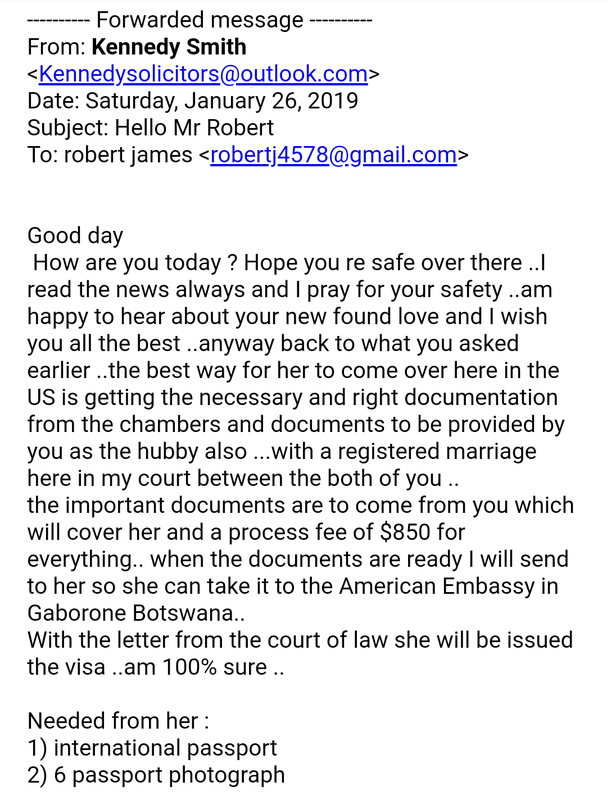 I’m sorry but you are our first romantic scam victim of 2019. Unfortunately, everything you’ve been told has been a lie. 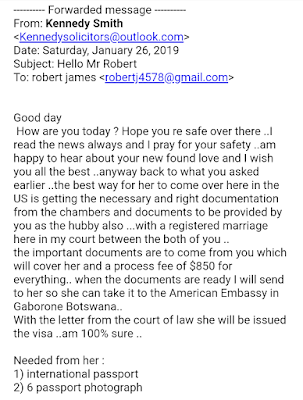 The emails and messages you sent me are typical of this sort of scam. He sent you pictures of himself in uniform and off duty but I was able to trace several of them quite easily on the web. They’ve been taken from a range of sources and trust me, none of them are the person you’ve been communicating with. I was also able to find that several of the pictures had been used before with other scam victims around the world. Also, and please forgive me for being skeptical, real people don’t propose marriage to someone they’ve never actually met. Not unless they’re either very naïve or more likely they have an agenda. The “lawyer” they asked you to pay doesn’t exist either. Real, respectable attorneys don’t use free email addresses. They also don’t use words like “hubby”. This is all about the money they want you to pay for this fictitious “processing fee” of $850. I suggest that, hard though it might be, you delete the emails and messages these scammers sent you and put this behind you. I’m genuinely sorry for the upset you’ve been through.